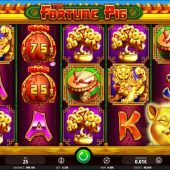 The Fortune Pig slot has a Chinese theme which seems to predominate iSoftbet's releases of late, when we consider 3888 Ways of The Dragon, Mystery of Longwei and Tree of Fortune have all appeared recently. I don't mind as they tend to do justice to this classic subject and here we get some really funky oriental music as our soundtrack instead of the usual pipes and cymbals stuff along with some powerful sounds and animations when wins appear. These reels have some bright and colourful characters on them despite the menacing look of the dragons either side of them, so can they add some fire to our bankroll? 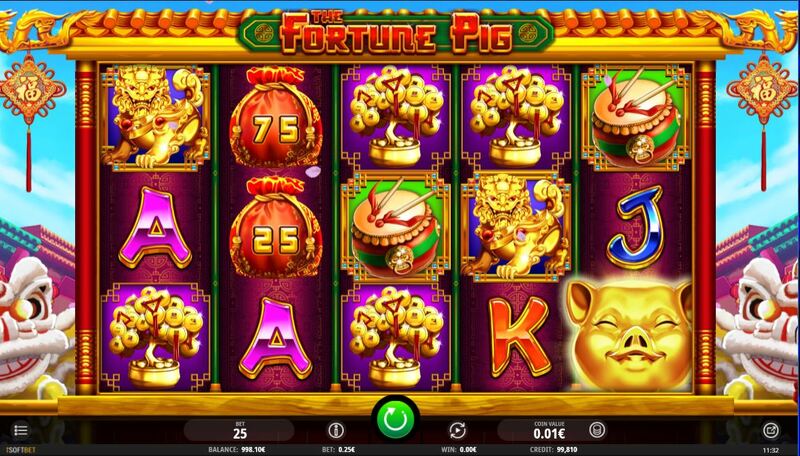 We find symbols are stacked on the Fortune Pig slot but despite this some decent pays are to be had on this 25-line game of 5 reels and 3 rows. Our main subject here, the Golden Pig, is the stacked Wild on all reels and will hand us a nice 40x bet for 5-of-a-kind on one of those lines. The Gold Lion pays 16x, Drum 12x, Token Tree 8x and Triple Token 6x with 4 card values of Ace down to Jack paying either 4 or 2x bet for a full line. There are also Money Bag symbols displaying coin values on all the reels which are stacked plus Dragon scatters on the odd reels, which tells us there are two bonus rounds available from this pig! If you get 5 or more positions on the grid covered with either single or stacked Money Bag symbols you are treated to a quite exciting respins round. The triggering Bags remain in place with their coin values and the remaining tiles spins individually with either blanks or Bags on them. You get 3 respins and every time another cash bag appears the 3 respins reset again. These Bags can have anything from 1 to 40x bet on them, and if you see the Golden Pig land he will hoover up all the frozen Bags and display the total of them on himself. This frees up all the covered tiles in order to land more bags. You can win some decent amounts here; its rarely disappointing. If the Dragon appears on reels 1, 3 and 5 you get 8 free games with no retrigger possible. These take place on the same reels as the base game but each spin 2 to 5 reels will be identical, like Twin Spin but unlike that slot the reels don't have to be adjacent. It's here you find your best chance of the top pay, full screen Wilds for 1000x bet.